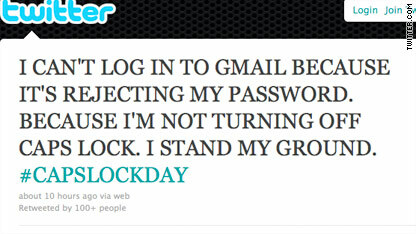 One of thousands of Twitter status messages about CAPS LOCK DAY. THERE'S NOTHING MOST TECH-SAVVY PEOPLE HATE MORE THAN SEEING THIS - THE ESSENTIAL SHOUTING OVER THE COMPUTER - THROUGH THE ENTIRE USE OF THE CAPS LOCK. I HAVEN'T A CLUE AS TO WHY WE ARE WE CELEBRATING SOMETHING THAT DRIVES MOST PEOPLE CRAZY - AND TO A POINT WHERE IT'S A TRENDING TOPIC ON GOOGLE AND TWITTER. A QUICK SEARCH OF THE WEB SHOWS ME IT WAS JUST AN IDEA THAT HAPPENED IN 2000 AND HASN'T STOPPED SINCE. I ALREADY CAN'T STAND LOOKING AT THIS POST IN ALL CAPS, IN THE SAME WAY I CAN'T STAND IT WHEN SOMEONE WHO'S NEVER TYPED AN E-MAIL BEFORE (THAT'S YOU, MANY MOMS AROUND THE WORLD) AND THEY TYPE IT IN MASSIVE 20-POINT, BRIGHT PINK, ALL CAPS FONTS. WE GET IT, YOU LOVE US. OR HATE US. OR WHATEVER YOU'RE TRYING TO CONVEY THAT YOU MUST SHOUT IT IN ELECTRONIC COMMUNICATION. NOT TO MENTION, AS SOME PEOPLE NOTED, OBSERVING THE HOLIDAY BRINGS YOU PROBLEMS WITH YOUR PASSWORD. so. with that. we at this just in, will scoff at the all caps, and go another route, marking this day of punctual sacrifice in a paradoxical ee cummings-esque style. (because that much caps lock, would even make me want to scream at me for typing this way.) so we say, forget the caps - completely. and we have the backing and firepower of the federal highway administration behind us. seriously. they just recently directed every city, town and place in the nation to make every new street sign must have upper- and lower-case letters in hopes of increasing legibility and reducing accidents. not everyone is happy - specifically - the city that never sleeps. it's known for its iconic signs in all caps. on the streets, subways and everywhere else. now the city says it would cost them more than $27 million to complete the task. and will anyone want to buy a street sign that says Madison Ave? certainly it's not as attractive as the iconic MADISON AVE. (apologies again.) and new yorkers are not happy either, the daily news reported. Okay, enough with the ridiculousness, our copy editors are probably up in arms by now. Let's just take this time to be thankful that while the Internet will be lit up in all caps today, it could be worse, we could be celebrating Comic Sans day. And we know how you feel about that. GET OVER IT, WHAT BABY DECIDED THAT CAPITAL LETTERS IS YELLING, THEN AGAIN, MAYBE IF YOU ARE GETTING ALL-CAPS YOU DESERVE IT BECAUSE YOU WERE NOT LISTENING/GETTING IT BEFORE. I USE CAPS LOCK ALL THE TIME BECAUSE MY EYESIGHT IS VERY BAD AND I CAN'T READ WHAT I AM TYPING WITHOUT THE CAPS LOCK ON. I AM SORRY IF THIS OFFENDS ANYONE. I AM CERTAINLY NOT EVER SCREAMING AT ANYONE. ( I WOULD ONLY DO THAT IN PERSON. HA-HA). I HAVE HAD THE PROBLEM OF BEING VERY FARSIGHTED SINCE THIRD GRADE. THAT'S MY STORY AND I'M STICKING TO IT!!!!!! Personally, I could care less if it is in caps or not. I prefer to judge the emotion of the comment by the words and punctuation used. If the commenter is unable to do that, well their message is lost when using all caps to "color" their comment when I read it. Not entirely meaning to be insulting here, but the US school system is seriously lacking on teaching many children reading and comprehension skills. This is often reflected in the comments people post on the web. Poor spelling, lack of punctuation, bad grammar, and the need to resort to name calling all indicate one thing to me – this was posted by an immature, and likely undereducated person. As such, I view the entire post as suspect in every way – facts, relevance, and the intentions of the poster. DON'T FORGET THAT VISUAL IMPAIRMENT REQUIRES, MANY TIMES, THE USE OF CAPS LOCK. AND SINCE THE SOCIETY IS GROWING OLDER, IT WOULD BE BETTER TO RETHINK THE "OLD RULES". (AND PLEASE, DON'T TRY TO TEACH US HOW TO USE THE ACCESSIBILITY TOOLS. WE ALREADY KNOW IT).